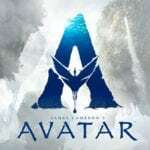 Starring Chris Pine, Aaron Taylor-Johnson, Florence Pugh, Tony Curran, Billy Howle, Callan Mulvey, Steven Cree, Daniel Campbell, Niall Greig Fulton, James Cosmo, Duncan Lacroix, Alastair Mackenzie, Sam Spruell, Ron Donachie, Jonny Phillips, Jamie Sives, Lorne MacFadyen, Gavin Mitchell, Tam Dean Burn, Vicki Liddelle, Margaret Fraser, Stephen McCole, Clive Russell, and Stephen Dillane. 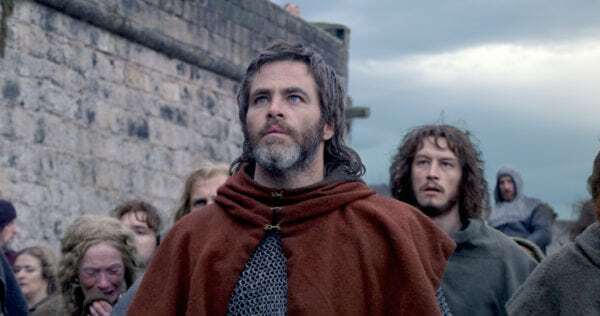 Outlaw King plays like a direct to home video Braveheart sequel that was lost in space and time and unearthed by Netflix. That’s not to say it’s necessarily bad, but this project re-teaming filmmaker David Mackenzie (Hell or High Water) and Chris Pine for medieval heroics and all-out bloodbath warfare (complete with era-appropriate weaponry beyond swords, such as ball and chain maces brutally inflict damage) for the untold but supposedly historically accurate true story of Robert the Bruce claiming the Scottish crown and picking up the rebellion where William Wallace left off, is unabashedly drawing inspiration from the classic yielding lackluster results. For a historical epic, Outlaw King is blunt, straightforward action fare more interested in cramming in as many betrayals, ambushes, and massive battles (the finale is certainly impressive in terms of production design and the numerous violent ways warriors on both sides of the fray meet their demise). And while I do realize this film technically has no direct ties to Braveheart, it’s difficult to shake the comparisons and fondly remember when the precursor to this narrative being told was a three-hour epic with fully realized characters to invest in. 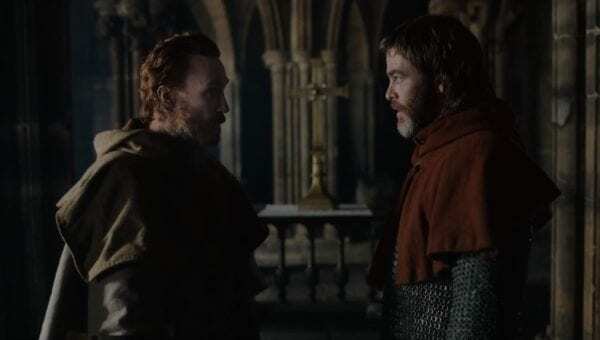 Here, when Robert the Bruce’s new wife Elizabeth (Florence Pugh) declares her loyalty to him versus the family that gave her away to him, it comes across as more of a bold decision based on nothing more on the fact that Robert is a good guy protagonist. Not enough of their emotional connection has been felt by this point. 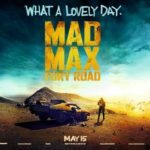 Oddly enough, despite the copious amount of times sharp objects pierce flesh (or in one case, intestines spill out of a wounded torso), it’s actually Florence Pugh that turns in some of the best acting (to be fair, I suppose this isn’t too challenging when the rest of the cast is engaging in machismo shouting contests and repeated displays of typical masculinity or overacting like crazy); she stands up for herself when Robert the Bruce is uncertain of her allegiance and sends her away from a family meeting, sells the traumatic moments for all their worth, and remains defiant even when captured. It’s a role where she is given little to do, but seems less so due to the performance commitment. Easily one of the best new actors to emerge on the scene (last year’s Lady Macbeth is an incredibly underseen absolute diamond of the film, and should be sought out by anyone that enjoys her presence here in Outlaw King), she continues to make a name for herself. Another up-and-coming young actor, Billy Howle (who, as far as I’m concerned dropped the ball not once but twice starring opposite Saoirse Ronan, and usually serves as a black hole of charisma) is present as Edward, Prince of Wales, seen as unworthy and incompetent by his kingly father (Stephen Dillane), and one raving mad ball of anger continuously erupting as the film goes on. It’s certainly the best work he’s ever done, making for an easy to hate villain that filters his ugly deeds through just the right amount of rage. Nevertheless, the intriguing dynamic between him and his father is lost among the proceedings jumping right into battle after battle, but at least it’s offset by serviceable acting and logical motivations. 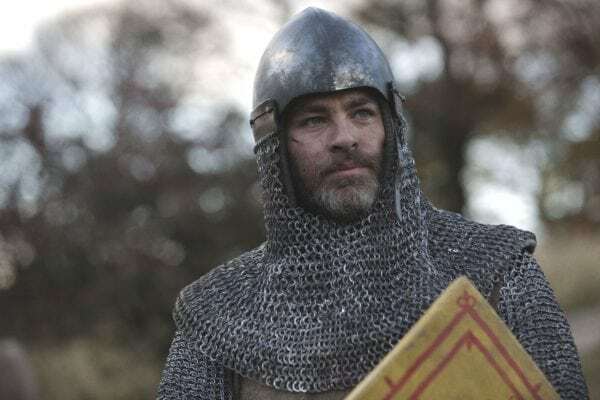 As far as period pieces ago, it must be admitted that Outlaw King‘s costume design frequently comes across as nothing more than high tier cosplay, and that Chris Pine slips in and out of his shaky Scottish accent. Chances are if a line of dialogue demands him to pitch his voice anything higher than a whisper, you’ll definitely notice the accent go bye-bye. The filmmakers do have the fortune of filming on location in Scotland, meaning that as you can imagine, the vistas and grassy landscapes are breathtaking, especially from overhead perspectives. Double that pleasure whenever armies are charging at one another ready to clash with the beauty of the land in the background. There is also a stunning tracking shot to open the film, following multiple characters around inside and outside a tent as characters swear loyalty to the British. The first 45 minutes of the movie switches between conversations and party feasts (complete with a rather dry and boring script to boot), but at least things look pretty even before their stained in red. The original music also fits the times, adding a little extra immersion to the experience. Taking into consideration Netflix’s distribution choices, on the whole, Outlaw King feels like the kind of movie subscribers would love to tune into late at night on a weekend while pounding away some leftover pizza; it’s action-packed and requires very little thinking. 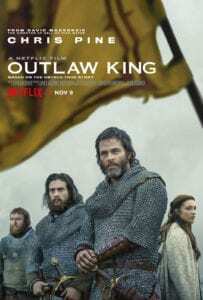 The production values only get better as the film goes on, as if they were saving all of the money for the climactic sequence, so when that is coupled with well-choreographed barbaric violence that never lets up, well, in addition to the ambushes on screen, Outlaw King sneaks up on the viewer as something digestible and entertaining. Everyone on the set seems like they’re having fun, which quickly becomes infectious even if the film is nowhere near great.